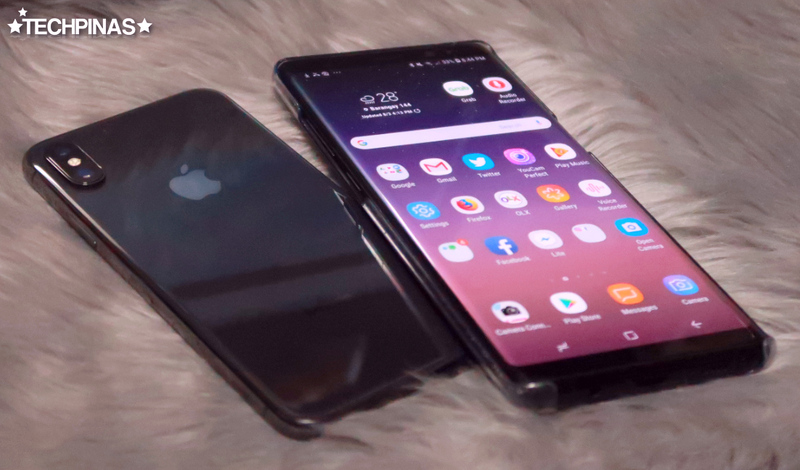 With all the many handset brands that are currently flooding the global market, I'm sure some of you are wondering which ones are actually doing well and getting the fancy of consumers worldwide. Well, for more than five years now, International Data Corporation or IDC has been holding its Worldwide Quarterly Mobile Phone Tracker study, which measures the overall growth of handset sales across the planet and in the process, reveals which brands are leading the pack in terms of total units shipped. 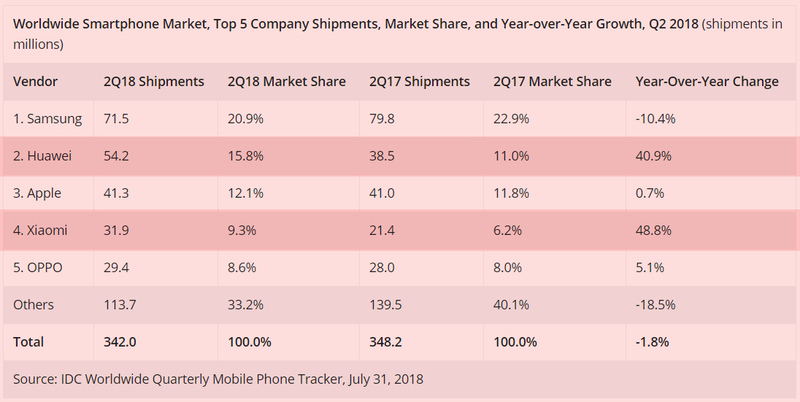 If - like me - you are interested to know which smartphone manufacturers are currently in front of the sales race, here are the Top 5 Handset Vendors based on total shipment data gathered by IDC within the second quarter of 2018 or from April to June this year. At number one, there's Samsung, which has been in this position since 2012. The Korean Giant has had a stellar streak at the top spot but interestingly, Q2 2018 is the first time when it got a negative year-on-year change in its total shipments. Aside from the lukewarm market performance of the Samsung Galaxy S9 and S9+ flagship duo, the company's midrange leadership was also challenged by rising brands from China. Good thing, the Samsung Galaxy Note8 is still very popular in the United States and Europe while the company's J-Series entry-level line continues to do well in many developing Asian countries. While Samsung experienced a notable decline in sales compared to the same period in 2017, tech giant Huawei got a whopping 40.9% increase in its year-over-year shipment numbers. The great market performance of the company's Huawei P20 Pro flagship model along with the success of the Nova mid-level line in emerging marketing like the Philippines allowed this renowned Chinese brand to finally break into the number two position. Of all major handset makers, Apple Inc. is the most conservative when it comes to releasing new devices. In fact, it's been almost a year now since the American company announced the Apple iPhone 8, 8 Plus, and iPhone X. Considering this, I think the slowdown in handset sales that they experienced in Q2 2018 was to the expected. Currently, Apple is at number three but once their new set of iPhones have been released, I believe their ranking will recover greatly. With a whopping 48.8% increase in its Q2 2018 smartphone shipments compared to what it got in Q2 2017, Xiaomi is the fourth most prolific handset vendor in the world. The sheer number of its phone models (so many that some of them already have confusing names) plus the fact that it is now the leading smartphone brand in India truly make this brand a terrifying competitor for the other companies in this list. OPPO's continuously growing presence in developing markets in South East Asia, Middle East, and India gave the company the number five spot, which is still remarkable considering that it is also the youngest brand in this bunch. Here in the Philippines, the OPPO F7 midrange smartphone, which was released in April 2018, has just become the company's best-selling model to date. Hot on the heels of OPPO F7's success, the brand released the OPPO Find X flagship smartphone, which comes with a slew of innovations including its notch-free All-Display face, Stealth Camera mechanism, and Super VOOC fast charging technology. According to IDC, smartphone vendors shipped a total of 342.0 million units globally during the second quarter of 2018, resulting in a 1.8% decline when compared to the 348.2 million units shipped in the second quarter of the previous year. To survive this slowdown, smartphone makers will have to focus on new innovative features and form factors along with sales incentives and promotions to drive growth in many highly competitive markets moving forward.